The story opens in 1920s America where the large Scimenti family has settled down in Brooklyn. More precisely, we are introduced to Marcella Scimenti, daughter of Giacomo, the infamous Italian sailor who kept us company in the previous books. Young, beautiful, headstrong, and a head full of ambitious dreams of one day becoming a Hollywood singer. Supported by her great family, Marcella takes flight (metaphorically-speaking) for the first time, but as it turns out, fate has many other plans, one of them being the Great Depression. As she grows and tries to make the best of her life in a country turned upside-down, she comes to learn many lessons about life, love, friendship, family traditions, faith, duty, and of course, profoundly-buried secrets destined to challenge all she has come to know. Periods of great change have begun in the world, and the people like Marcella are only following suit. Though I would highly recommend you read the two previous books just for their quality, I don't believe they're necessary to understand or enjoy this one. There are of course allusions to the past you'd be more familiar with had you started in the right place, but ultimately the story and characters stand on their own and newcomers to the trilogy won't feel lost in any way. Each of the books in this series deals with the coming-of-age of a young girl, approached from vastly different perspectives. In the first one we were taken in the heart of the Boxer Rebellion in China, in the second one the challenges revolved around religion, and in this one our protagonist strives for independence in the midst of the Great Depression, on a personal and professional level. While personally-speaking I can't say I remember much from the 1920s, it feels like once again the author did as much research as humanly possible on that time period to recreate it as accurately as can be. When depicting this unique time period she places most of her focus on the people, their mindsets, values, concerns, aspirations and morals. By the time she is done creating the setting and giving us context, we feel the weight behind Marcella's plight. Her search for independence is nothing if not equal parts inspiring and educational. Her relentless optimism and energy to achieve her own dreams is admirable and endearing, especially when taking into account the economic context in which everything is occurring... I would even call it contagious. Even during the more difficult parts of her life when she goes from one failure to the next, we cannot help but share her headstrong attitude towards life and feel as inspired as she is to keep ploughing forward through the pain. I suspect Romano aimed to shed some light on the struggles faced by young, modern American women back in those days, especially when Marcella finds herself torn between her love for her family and her dreams of making a new life for herself elsewhere. Though this book may take place a hundred years in the past, the issues it deals with are timeless. There is certainly quite a lot of food for thought for us to digest in this book, but if we take a moment to look past it we will see an extremely engaging and fast-paced story which keeps us engaged from one chapter to the next. There is seldom a lull to be found in these pages, with there always being something happening in the large Scimenti family. Romano doesn't really divide her time between moving the plot forward and characterization, preferring to integrate the two together so we naturally learn about the characters as the events of the book progress. Additionally, the twist of the secret she learns about her family makes for a great source of internal conflict and throws a nice big wrench in everyone's plans. In my opinion, this is a huge part of the equation which helps this trilogy solve the problem many other lesser romance novels run into: segments of absolute boredom. As a matter of fact, it felt to me as if this novel had less of a romantic aspect than previous ones. We certainly do end up exploring love in various ways, but most of the focus seems to be dedicated to Marcella's journey towards forming her own identity and the worldly difficulties she encounters along the way. Her life and that of her family seem to be so fast and furious we barely have time to stop and smell the flowers of classic romance. To conclude this review of the final book in the Wayfarer Trilogy, I will simply say I hope it raises the standards of all romance authors out there. 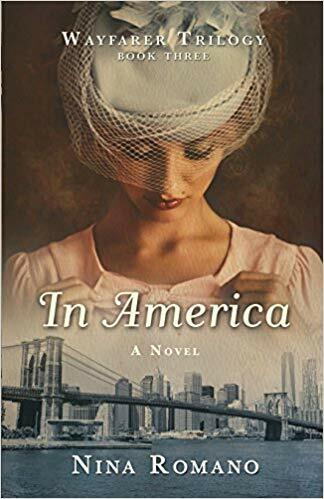 In America, just like the previous books by Nina Romano, is a perfect example of the genre's potential in terms of plot, character development and meditations on humanity. I highly recommend it to anyone who enjoys historical family dramas as well as anyone looking for unconventional quality romances. 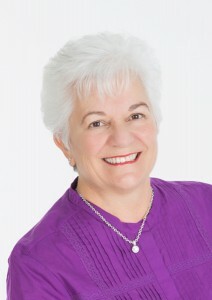 Nina Romano is an author with an M.A. From Adelphi University, as well as a B.A and an M.F.A. in Creative Writing from Florida International University. Her worldly travels and twenty years spent in Rome have inspired her to write a few poetry collections including Coffeehouse Meditations and She Wouldn't Sing at My Wedding. She has also authored a series of novels in the Wayfarer trilogy, starting with the widely-acclaimed The Secret Language of Women.